Most of us access Twitter using the plethora of Twitter apps available from the AppStore. Right? Well that didnt stop Twitter in improving themselves by rolling out a HTML5 version of Twitter.com to iPad users. 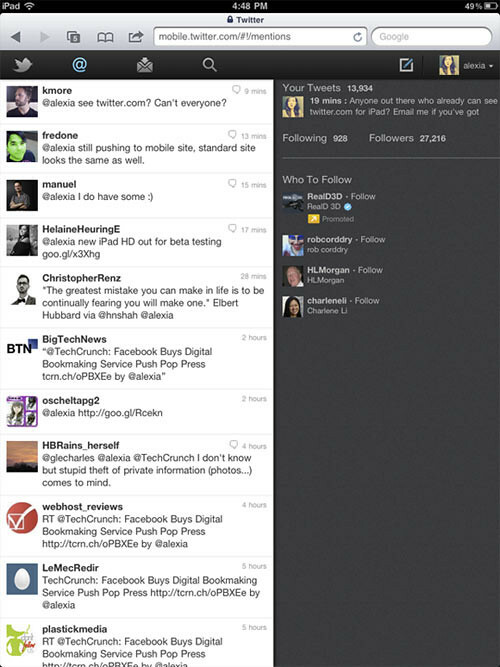 Twitter has already released a HTML5 version of it’s site for phones recently. This iPad web app was kind of expected to be on the way. The new iPad web app includes the dual panes you’re familiar with from the desktop version, showing your timeline on the left as single tweet views and miscellaneous information displayed on the right. The new web app is being rolled out slowly but everyone should have access to it within a week. Do drop us a comment to let us know if you have got it.